So today I am at the soup kitchen, as you can tell from the picture above. And I make this stew I think is beautiful. I got it out of "The Moosewood Restaurant Cooks For a Crowd." My sister Katie gave it to me. I was making Caribbean Black Beans and I added a whole mess of wonderful ham to it. It is great to take a vegetarian stew recipe even if you are going to add meat to it because most meat stew recipes, they have nothing but meat and onions and spices and maybe tomatoes, never many vegetables. 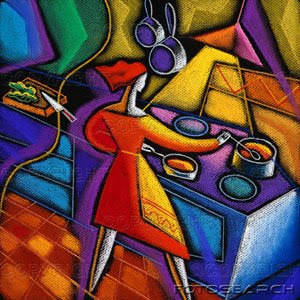 So it is good to start with a vegetarian recipe and then think about adding the meat. I served myself a bit to taste it and it was wonderful. You saute up these onions with all these herbs and spices and then you add the beans, plus, I added some leftover baked beans the kitchen had in the fridge. Plus the ham. Then it baked in orange juice. I would serve this for a party! That is how good it was. Then I made a rice pilaf to go with it. And here is what happens. I am done and ready to leave because I have to interview Kaye Ballard, remember, about Leonard Pennario. And one of the guests shows up who is staying in this shelter where I cook at, as we like to put it in Buffalo. "What's for dinner?" he asks. This is a question we are not supposed to answer but I am stupid so I do anyway. I said it was a Caribbean ham stew with black beans. "I don't eat beans," this oik says. Oik is a British word I am picking up from my British music buddies on Twitter. It means schuft! "Well, you don't have to eat the beans," I said. "You mean I can pick them out?" "You can do whatever you want," I said. "You can eat the ham. The ham is in big pieces." And this schuft, this oik, just looks at me angrily! Then he goes on whining and complaining. And I start getting all mad. Everyone is so entitled! That is what I whispered to Jim, the volunteer in the front office. He rolled his eyes and agreed with me. So once again I will be getting no time off from Purgatory because of my, ahem, charity venture. Number one I get mad at the people I serve. "Bums" is the word coming to mind at the moment. And number two it made me mad so here I am writing about it for all the world to see. There are points deducted for that, too, in the great hereafter. I will probably end up in Purgatory for a long long time the way I am going. And not only that, but I will probably have to cook there! Here is an artist's rendering of Purgatory. I am the woman with the laurels on my head, on my way to the kitchen! Meanwhile Pennario will be up there in heaven thanks to all the candles I lit for him at church, which, I lit one just this morning. And he will be wondering where I am. So will my father -- and my grandfather the Lackawanna haberdasher, whose birthday is today. All because I let that bum today get me mad and then I wrote about it. Not only that, but I used Howard's joke in the headline. "Soup to nuts" is what Howard calls my, ahem, charity venture. Today I say, he is right! Lots of "bums" in your purgatory picture!! Ha, ha! How did I miss that about the bums in the Purgatory picture? I could have written, "There are a lot of bums!" Darn! 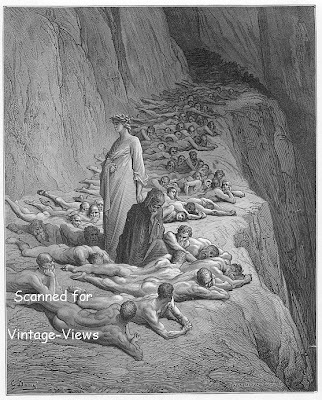 I think there is a bum or two also in Dante's "Divine Comedy." Sometimes I summarize the highlights of your blog posts for my Domesticated Partner, since he doesn't read them. It can get frustrating sometimes. I told him that you used a recipe from the Moosewood Cookbook but added ham to it, which I thought was pretty funny. He didn't understand what was so funny about that. So I had to ask him if he'd ever heard of the Moosewood, and he didn't. Then I had to explain all about Mollie Katzen and the Enchanted Broccoli Forest. I also mentioned that Howard describes your volunteer efforts as "Soup to Nuts." He said that not all homeless people are crazy (really?). Yeah, I said, but Soup to Nuts! Get it? Isn't that funny? Turns out he never heard of that expression. Oh well.